Article number: Bebe Au Lait Premium Muslin Blankies-Piper/Tea Rose-2 pk. 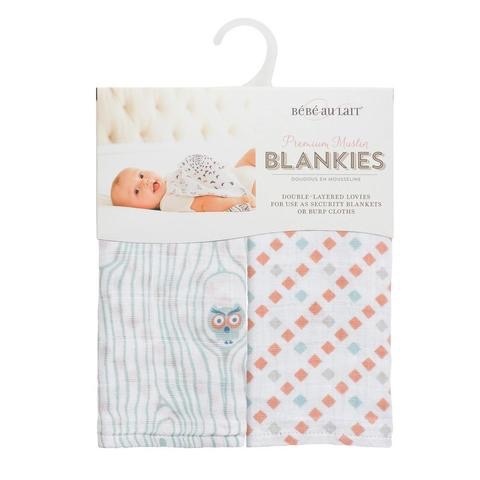 Bebe au Lait Premium Muslin Blankies are multi purpose and perfect for your stylish baby to bring everywhere you go. 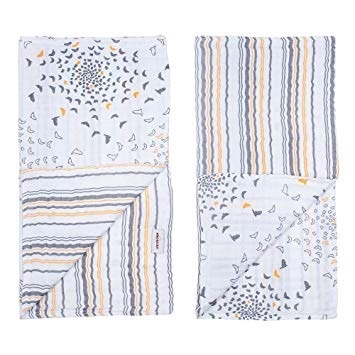 The double layered, open-weave cotton muslin is ultra soft and breathable, making these blankets ideal security blankets or super-soft burp cloths. These colorful blankies come in sets of two, so there’s always a lovey for baby to snuggle with, even when one is in the wash. Bebe au Lait Muslin Blankies are machine washable and measure 17-inches by 17-inches each. All Bebe au Lait products are made of the highest quality materials and tested to meet international safety standards. Designed by parents for parents, Bebe au Lait is the practical and luxurious choice that mom’s reach for first.